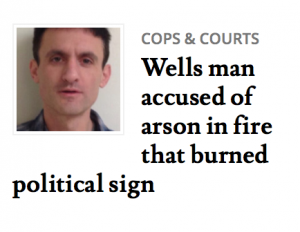 A 39-year-old man who lives in Wells, Maine was indicted for arson for setting fire to a homemade political sign promoting President Donald Trump, according to police in South Berwick, Maine. Police announced the indictment Friday, February 8, saying it occurred Tuesday, February 5. The incident, according to a written statement from South Berwick police, took place December 9. South Berwick is a town of about 7,000 people on the New Hampshire border about 40 miles southwest of Portland, Maine.